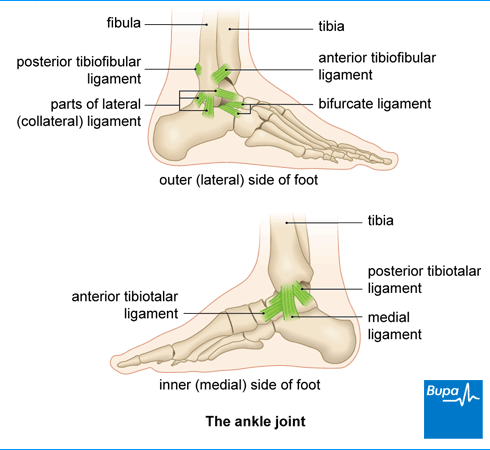 A sprained ankle happens when you hurt one or more of the ligaments (bands of tissue) around your ankle joint. Your ankle may be painful and swollen, and you may find it hard to move your foot properly. A sprained ankle is a very common injury. It can happen when you twist or turn your foot beyond its normal movement (people often say they have ‘gone over’ on their ankle). This can stretch or tear the ligaments that support your joint. Ligaments are bands of fibrous tissue that connect one bone to another. You may be more likely to have an ankle sprain if you play a lot of sports or you’re prone to falls. A sprained ankle can be very painful. But the good news is that most ankle sprains heal well. With simple self-care advice, most people get better after a few weeks and return to their normal activities in a few months. Your doctor may use a set of rules to ‘grade’ your sprained ankle. This will help them to work out how bad the injury is, how it needs to be treated and how long it will take to heal. In some cases your doctor might arrange a scan, such as an X-ray, to help them decide on the grade. They may also arrange the scan to exclude the possibility of a broken bone (a fracture). A grade I sprain is a mild sprain, which happens when you overstretch a ligament. You may have mild swelling, bruising and pain around your ankle, but you should be able to put some weight on your foot. A grade 2 sprain is a moderate sprain. This happens when you overstretch and partially tear a ligament. You may have quite a lot of swelling, bruising and pain around your ankle, which may feel a little unstable (wobbly). You may find it difficult to put weight on your foot. A grade 3 sprain is a severe sprain, which happens when you completely tear a ligament. The swelling, bruising and pain around your ankle are usually very bad. Your ankle may feel quite unstable (wobbly) and you won’t be able to put any weight on your foot without a lot of pain. If you’re worried about your ankle, or you’re in a lot of pain, you may choose to go to the hospital emergency department. Or you may decide to visit a community or sports physiotherapist. For simplicity, we’ll just refer to ‘your doctor’ below, but this includes these other healthcare professionals too. Your doctor will ask about your symptoms. They’ll also ask exactly how you hurt your ankle and whether you could stand and walk afterwards. They may ask you about your medical history and whether you’ve had similar problems with your ankle before. Your doctor will examine you, checking for pain, swelling and bruising around your ankle. They may also check how much you can move your ankle and whether you can put any weight on your foot. Your doctor will usually be able to diagnose a sprained ankle by listening to what you tell them and by examining you. But you may need some tests, such as an X-ray if your doctor thinks your injury is a bad one. This is because you may have a fracture (broken bone) instead. They may also arrange an ultra-sound scan or a magnetic resonance imaging (MRI) scan to work out if your ankle ligaments have been torn or simply stretched. Treating a sprained ankle aims to reduce pain and swelling. It also makes sure your ankle can keep or get back to its usual range of movement as soon as possible. It can be frustrating, but it may take several months to recover from a sprained ankle, especially if it’s very bad. So, you may need to be patient and follow treatment advice carefully. You may need to use a mixture of self-care, medicines and exercises. If you have a sprained ankle, there’s a lot you can do to ease your symptoms in the first few days. If you see a doctor, nurse or physiotherapist, they’ll probably advise you to follow the steps below. You can take certain over-the-counter painkillers, such as paracetamol, to help ease your ankle pain. If over-the-counter painkillers don’t help, your doctor may offer you a prescription for stronger pain relief. Forty-eight hours after your injury, your doctor may also suggest you take oral ibuprofen (such as tablets or capsules). Ibuprofen is an anti-inflammatory as well as a painkiller, so will help to reduce the swelling around your sprained ankle. It’s best not to use oral ibuprofen and other similar medicines in the first two days after your injury as they may delay healing. Ibuprofen and other similar medicines are also available as gels and creams (topical medicines). You can use topical painkillers as soon as you hurt your ankle to help relieve your pain. Always read the patient information that comes with your medicine. If you have questions, ask your pharmacist or doctor for advice. The right time to start exercising your ankle usually depends on how bad it is. If your ankle sprain is mild, you should start moving your ankle as soon as you can. Once your pain isn’t too bad, start doing some gentle exercises too. These may help prevent stiffness and will eventually get your ankle moving normally. But if you’re at all worried about doing exercises or feel any pain, stop and speak to a doctor, nurse or physiotherapist before continuing. In the first few weeks when you’re recovering from a mild or moderate sprain, you could try doing the following exercise every so often. Physiotherapists call this ‘plantarflexion / dorsiflexion’ and it helps keep the muscles stretched so you don’t lose the range of movement in the ankle joint. Sit down comfortably in a chair. Hold your leg out quite straight. Gently stretch your foot upwards towards your body as far as feels comfortable. Point your foot in the opposite direction, away from your body, and do the same for five seconds. Another stretch you could do is called a ‘seated heel raise’. Sit down in a chair with both of your feet flat on the floor. Keeping your toes touching the floor, raise your heels up as far as feels comfortable. Slowly lower your heels back to the starting point. If you have a bad sprain, your doctor may advise you to immobilise it. This means keeping your ankle still, and will probably only be for a few days. Your doctor may also advise you to wear a below-knee cast or brace. This may help to reduce any pain and swelling around your ankle quicker than a compression bandage. If you’re not sure when and how to start exercising your ankle, ask your doctor, nurse or physiotherapist and follow their advice. If your sprained ankle is very bad, you may benefit from physiotherapy. This aims to keep your ankle moving, prevents stiffness and strengthens the muscles and joints around your ankle. Having strong ankle muscles and joints may mean you’re less likely to sprain your ankle again. Your physiotherapist may ask you to focus on building your strength and mobility through co-ordination exercises and balance training. It’s important to stick to the exercise plan your physiotherapist recommends. If you sprain your ankle, it’s very unlikely you’ll need to have surgery. But if your ankle is badly sprained, still feels wobbly and keeps getting sprained or giving way causing you to fall, it’s possible your doctor may recommend surgery. You’re more likely to need surgery if you play sports, or are an athlete, at a professional level. Your doctor may refer you to an orthopaedic surgeon (a doctor who specialises in bone surgery). Recovering from a sprained ankle can be frustrating, as it can take several months before you’re back to your normal activities. Most ankle sprains get better completely and don’t cause any long-term problems. Your recovery time will depend on how bad your sprain is (see Types of sprained ankle above). If you play sports, you may be out of action for up to six months. If your sprained ankle is mild (a grade 1 sprain), you may be able to walk within the first two weeks after your injury. You may be able to fully move your ankle without any pain within six to eight weeks. You can probably go back to playing sport within eight to 12 weeks. If your sprained ankle is moderate (a grade 2 sprain), it may take you two to three months to recover. You’ll need to take care, as you may be prone to spraining your ankle again in the first four to six weeks while you recover. You may notice some pain and occasional swelling for some time afterwards. A severely sprained ankle (a grade 3 sprain) can take several months to recover and you may even need surgery afterwards. Some people with a very bad sprain have permanent damage to their ankle, which may remain unstable (wobbly) and painful. Ask your doctor or physiotherapist when you can safely take up your normal activities again, including sports. If you start too soon, you may hurt your ankle again, which may lead to long-term problems. You should usually avoid all sports and vigorous activities involving your ankle for at least three or four weeks after a sprain. If you’re worried about how long your ankle is taking to recover, or your symptoms get worse, speak to your doctor or physiotherapist. You’re most likely to sprain your ankle when your foot twists suddenly so that your sole is facing too far inwards. This is called an inversion sprain. Twisting too far can make the ligaments on the outside of your ankle stretch past their normal range. Some of the ligament fibres may tear, or the ligament itself may be completely torn. Sometimes more than one ligament is affected, and occasionally small pieces of bone may tear off too. You may be more likely to sprain your ankle if you haven’t trained properly or you’re very inexperienced with a new sport or activity.You may also be more prone if you wear unsuitable footwear, don’t exercise regularly or have a medical condition that affects your balance. If you’ve sprained your ankle before, you’re more likely to do it again. This may be because the ligaments didn’t heal properly the first time so they’re now weaker. There are a number of things you can do to reduce your chances of spraining an ankle. This includes keeping the muscles around your ankle as strong and as flexible as possible. Some other things you can do are listed below. Wear shoes that are suitable for the activity you’re doing and in good condition. Wearing high-heels or platform shoes can be risky, especially on uneven ground. Take care when you’re walking or running on uneven surfaces – exercise on even surfaces if you can. Warm up and stretch your muscles before playing sport, and cool down afterwards too. During certain activities it may help to wear high-top shoes (ones that go above your ankle), an ankle brace or ankle tape. Stay a healthy weight for your height – sprains are more likely if you’re very overweight. When should I see a doctor? When should I see a doctor? You can usually treat a mild sprain by following some self-care measures at home. But bad sprains may need medical attention. You may have damaged other parts of your ankle such as the bones or tendons. And it can be difficult to distinguish between a very bad sprain and a fracture (broken bone) without an X-ray. Seek medical attention straightaway if your ankle is too painful to stand on, it seems deformed or your skin is broken. You should also have your ankle checked out if the pain and swelling get worse rather than better over the first three to four days. Always see a doctor if your ankle was injured in an accident where there was a large force involved. This includes a fall from a height or a blow from a heavy object. How long will it take to recover? How long will it take to recover? The length of time it takes for you to recover from a sprained ankle will depend on how bad your sprain is. Mild sprains may take up to eight weeks to fully recover, while moderate sprains may take a few months to get back to normal. If you have a very bad sprain, it may take several months to recover, especially if you need surgery. Everyone’s recovery time from a sprained ankle will be different. So, ask your doctor or physiotherapist how long your recovery is likely to be. If you want to start, or go back to, sports or other physical activities, check when and how you can do this safely. See our section on Recovering from a sprained ankle above for more information. Can my sprained ankle cause permanent damage? Can my sprained ankle cause permanent damage? Most people make a full recovery after spraining an ankle. But if you’ve had a badly sprained ankle, this may leave you with some permanent damage. You may also sprain your ankle again if the ligaments haven’t healed properly. After your injury, it’s important to begin gentle exercises when you can, as these prevent stiffness and keep your ankle moving. Exercise, as well as an elastic support, ankle tape or a brace, may help to protect your ankle from further sprains. If your sprained ankle doesn’t get better, or your symptoms get worse, after treatment, see your doctor or physiotherapist. What’s a high ankle sprain? What’s a high ankle sprain? A high ankle sprain (syndesmotic sprain) is seen mainly in people doing contact sports and in skiers. In these sprains, the syndesmotic ligament between your two lower leg bones (tibia and fibula) becomes stretched or torn. This may happen if your lower leg and foot twist too far up and outwards. If you have a high ankle sprain, you may feel pain at the front of your lower leg and when you move your foot outwards. This area may be tender to touch. High ankle sprains take longer to heal than the more usual type of ankle sprain. Your treatment may include wearing a fracture boot or short leg cast for several weeks.